There is a popular belief that once winter arrives it’s time to down tools and leave the gardens to their own devices. Not a bit of it. You may be surprised to learn that our intrepid and very dedicated volunteers and staff work 363 days a year to ensure our displays, borders, lawns, hedges, orchard and walled garden all look superb year in and year out. They work through rain, snow, hail and everything in between that the weather can throw at them. Below the boys are planting tulip (Daydream) ready to dazzle our visitors in 2015. If you love gardens and the outdoors, please do pop by and have a chat. A short interlude will no doubt ease their backs and who knows you may learn a nugget of horticultural wisdom in the process. For those of you who are members of the National Trust. Did you know that every time you visit us you help contribute £3.55 to The Vyne? So, enjoying a day with us means you are supporting your favourite place. 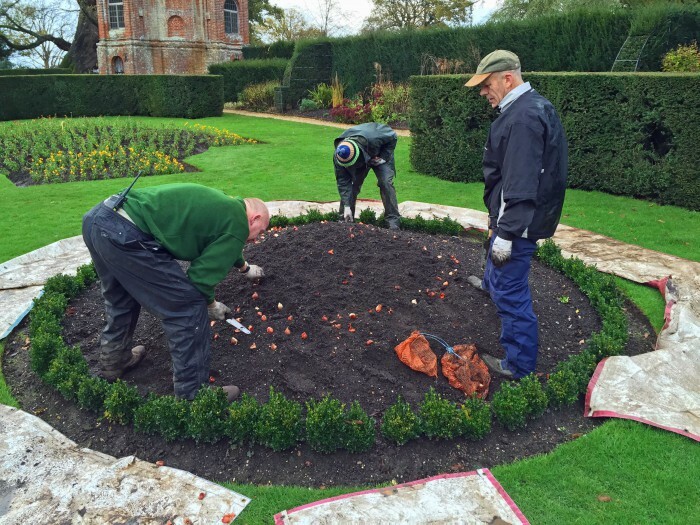 The gardening team (Dennis, Pete, Peter) get stuck into the winter bulb planting. Struggling for ideas this festive season? National Trust membership is a gift that keeps on giving all year round and allows that special someone to enjoy all our places too.